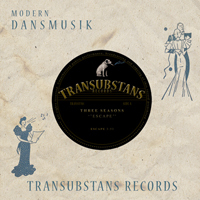 Following the very critically acclaimed album "Life's Road", Swedish acid rockers THREE SEASONS now delivers a new 7"-single: ESCAPE. Here you'll find two exceptional tracks - the swift, 60's power trio-rock of "Escape" and the lengthier, very travelling piece that is "Wood To Sand". Undoubtedly, Three Seasons have found the sound here, bringing amazing riffs and the most wicked guitar sound to the table! Psychedelic-laced heavy blues at its very best! Furthermore this release also marks the start of the Transubstans Vinyl Club, being available in 400 copies on black vinyl as well as a limited edition of 100 copies on red vinyl. For them enjoying elements from bands such as LED ZEPPELIN, JIMI HENDRIX, PINK FLOYD, DEEP PURPLE and SANTANA, this is a must have !